Bill’s passion for paper began right out of college, selling paper for a mill, where he learned the ins and out of all things paper. In 2004, however, Bill heard the call of a different siren song. He bid adieu to selling paper, jumped into the world of stationery with both feet, and hasn’t looked back since. For over twenty years the music industry was home to Joan. As a General Manager, she successfully juggled all aspects of running major concert venues and events. She took a break from the music biz to raise their four children and a few years ago, joined Bill on the stationery side of life and has enjoyed every minute. 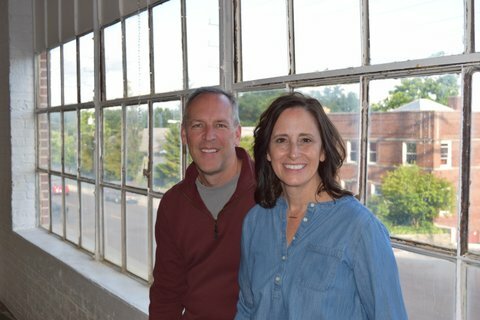 In 2017, Bill and Joan decided it was time to take their experience to the next level and open EdgeWorks Studio. Where client relationships take priority, along with producing products of the highest quality – Bill and Joan truly understand the meaning beautiful handcrafted stationery can bring to people’s lives. Located in the historic Elgin Watch Company building just outside of Chicago; their dream has become a reality.